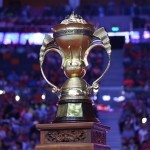 The Sudirman Cup is the World Team Championships, held every two years, and one of the most prestigious titles in the sport. The event was first held in the Bung Karno Stadium, Jakarta, Indonesia 24-29 May 1989 with 28 nations taking part and it now attracts more than 30 national teams with 59 teams entering in the 1997 Sudirman Cup in Glasgow Scotland. Until 2003 the Sudirman Cup took place alongside the World Badminton Championships (Individuals) before becoming a stand alone Championships for the first time in Eindhoven, Netherlands in 2003. Since 1989, only three countries – Indonesia, Korea and China, have won the Sudirman Cup. The Chinese Team win in 2015 was their 10th win of the Sudirman Cup.